One of the most interesting yet useless accessories to the Droid Bionic is the lapdock. When I first saw it at CES I thought it had some potential even though I was astounded that it came with Firefox instead of Chrome. As the reviews came out and I finally spent some time with it, it became obvious that it was hardly useful between the half-baked OS and the horrible mouse and keyboard. That said, I do think that Motorola had a great idea with a bad implementation. As phones become more powerful and limitations are breached, we’ll still have the issue of trying to do something on a small screen that works better on a larger screen. Motorola’s lapdock and desktop adapter are both trying to give users other form factors to interact with their content on their phones. The problem is, I don’t think Motorola really understands what problem they’re trying to solve (if any). I’ve never had the desire to use my phone on a larger screen, except for something like a game. I think that is why many people avoided the original Galaxy Tab and waited for Honeycomb – they want a different experience on different form factors. Google’s UI makes sense on a phone, but it doesn’t translate in a mouse and keyboard implementation. Motorola’s attempt to remedy that issue with an application dock and Firefox (seriously, how did Andy Rubin not demand they make the browser Chrome?) gave the illusion of a desktop experience without really delivering. The other problem that needs to be solved is the problem with applications on lapdock and deskdock form factors. 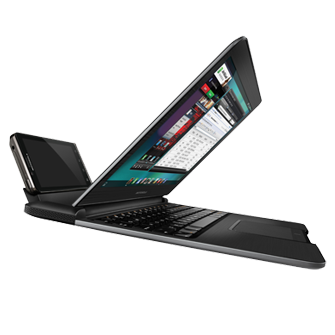 The ASUS Transformer represents one possible solution: use a mouse and keyboard on Honeycomb. This solution may fit some users’ needs, but I don’t think it’s the best solution. A second solution would be for Google to develop their own desktop OS like Windows, OS X, or Linux for lapdocks to boot into. At this stage in the game, however, I don’t think Google sees any value in creating their own desktop OS. Because everything is slowly becoming more mobile, I think Google will continue to push Android and the third option: Chrome OS. I’ll be among the first to say that there are some serious limitations to Chrome, but I’ve also found that the majority of the time I don’t have anything open on my MacBook, netbook, or desktop save Chrome. When I need to sit down and write a paper for class I still open up Microsoft Word, but if Google Docs offered more functionality then I would have no reason to use Word. I know for a lot of people they need larger apps like QuickBooks, Photoshop, and Final Cut Pro to really be productive, but I don’t see any reason why Chrome couldn’t fit the needs to most users. As our computing experiences continue to move to the web and storage issues continue to be solved by the cloud with various services I think many people will be able to move to a Chrome only experience. I know I would feel more inclined to try a lapdock form factor if it booted into Chrome and my phone’s notifications were tied into the system. It is not a one size fits all solution, but that kind of thing won’t exist until Windows Phone 7 devices are powerful enough to boot Windows on a connected device. Even then, by the time cell phones are powerful enough to handle running a full separate OS like Windows I imagine more and more companies will be making versions of their applications that are web-only. I think there will come a time where Internet speeds will stop barring innovation and where people will be able to have full desktop applications like QuickBooks or Photoshop run in their browser. Many of these things are still far off, but a good first step to resolving these problems with notifications and making lapdock and deskdock form factors useful would be to use Chrome OS. I think there will always be a place for a mouse and keyboard form factor because touch doesn’t always make sense. As computing continues to become more mobile and as technology improves, we may eventually be able to have one device that connects to different form factors. What do you think? Would you be more inclined to buy a lapdock or desktop dock if it ran Chrome OS? Do you think things will continue to move to the web, or will there always be a place for operating systems like Windows, OS X, and Linux?